See IM3™ for Free at the ASNT Annual Conference — Inuktun Services Ltd.
With the ASNT Annual Conference fast approaching, we want to make it a little easier for you to see our IM3™ (Inuktun Multi-Mission Modular) technology at the largest dedicated gathering of industry professionals, equipment and technology suppliers, and engineers and researchers working in the field of nondestructive testing (NDT) and evaluation of materials in the world. Inuktun has a limited number of FREE one-day exhibit hall passes for the event taking place Sunday, October 28 through Wednesday, October 31 at the George R. Brown Convention Center in Houston, Texas, USA. Request your free exhibit hall pass now and find Inuktun’s inspection cameras, miniature magnetic crawlers and pipe inspection vehicles on display in booth 423. The Spectrum Tank Inspection Kit, STIK™, is a turnkey remote visual inspection system for integrity assessment of tanks, pressure vessels, rail cars, and more. It is the portable, convenient and efficient tool that every inspector needs to know about. The MaggHD™ is a waterproof miniature magnetic crawler that incorporates a 360-degree continuous tilt video camera with 1080p HD video, a 10x optical zoom, variable intensity spot and flood lights, and optional parallel laser lines for on-screen size estimation. Based on the proven MicroMag™, Inuktun’s MaggUT™ magnetic crawler is a man-portable system with integrated UT scanning capability. Specifically designed to incorporate standard industrial ultrasonic probes and flaw detectors from Olympus, the MaggUT™ easily integrates with your existing NDT equipment. The Versatrax 50™ is a miniature remotely operated crawler that can inspect pipes as small as 50 millimetres (or two inches) in diameter, the ideal solution for confined space entry and inspection. 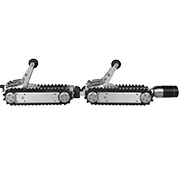 Combining the power of three Microtracs™ and an expandable tripod chassis, the unique VT100 Vertical Crawler™ can easily navigate multiple bends and vertical pipe segments. Constructed out of marine grade aluminum and stainless steel, the VT100 Vertical Crawler™ is extremely durable and fully submersible for underwater applications. See firsthand how IM3™ technology simplifies integrating cameras, NDT tools, sensors and end effectors, allowing owners and operators to create purpose-built inspection systems that collect the exact data required in order to determine the remaining useful life of capital assets in your industry. Can’t make this show? Contact our friendly and knowledgeable sales team for an IM3™ solution to your nondestructive testing problem today! Thanks for your message. We’ll be in touch soon!